Kaboom! 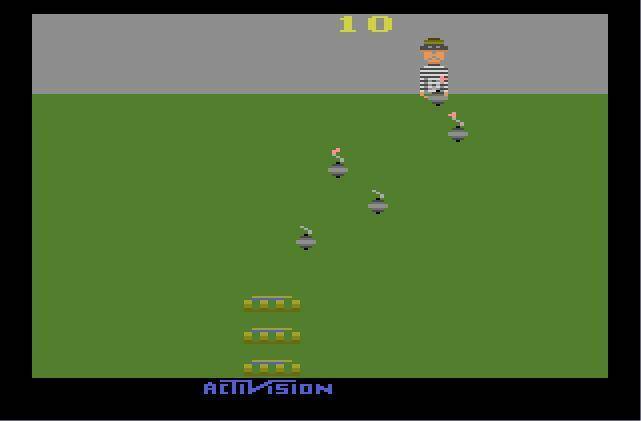 is the first of Activision’s games that was not released solely on the Atari 2600. However, it is the version I shall discuss (by way of Activision Anthology on the PlayStation 2 that is). Released in 1981 and designed by Larry Kaplan, versions were also released for the Atari 5200 and their line of 8-bit computers. It would’ve been nice to see these additional versions included in Activision Anthology, but the package was quite the focused effort. I want to say this is the simplest game of the bunch I’ll write about, but they’re all pretty simple. If I took this game to my parents, they’d instantly get it, and be hooked for a short while too. The “Mad Bomber” resides at the top of the screen and will drop bombs as long the player has buckets to catch them. Miss three bombs and that’s it. This is a score attack game through and through. 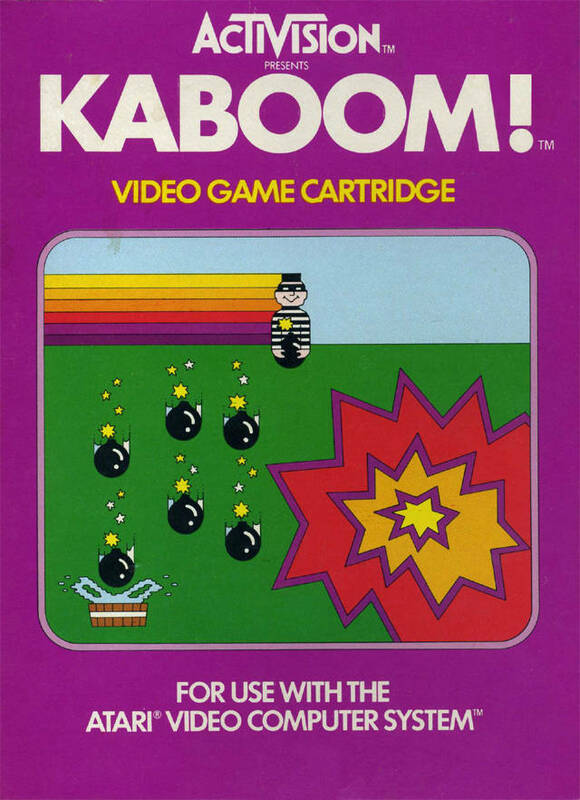 On the Atari 2600, Kaboom! utilized the paddle controller which featured a knob not unlike a radio dial. Turning it moved the buckets. This aspect of the game doesn’t hold up in Activision Anthology. Using the analog sticks or the d-pad just doesn’t cut it 100%. It’s workable, but I think it’d be tough to really excel. I have played the iOS version and using the touch screen is a good alternative, but that makes it too easy. I know, I know – I’m hot, I’m cold, I don’t know what I want! Either way you play it, play it; I really like this game. Analog sticks and d-pads aren’t ideal for this game. With the PS2 version being my main version, I did put in the time to unlock Kaboom!’s patch and commercial. Unlocking the patch was a walk in the park compared to what was originally required; unlocking it required at least two hundred points compared to the original sum of at least three thousand! I really like the way you review these vintage games for what they were and what they meant before games became this complicated. Thank you! I remember playing through these compilations fondly.